"The phone is ringing, the doorbell too, there’s a zillion emails waiting for a response. There’s forty plus writers waiting (rather impatiently) for edits of their work, not to mention the dozen books waiting to be read from authors wanting blurbs or opinions. I have to leave soonish and push my book at various events. There's two blogs waiting for posts, and If I go onto Facebook I’m surely doomed," says Ivor W. Hartmann, a Zimbabwean writer, editor, publisher and visual artist, currently based in Johannesburg, South Africa, when asked what is hard for him as a writer. Ivor is a very painstaking writer who works with the meticulousness of a lapidary. 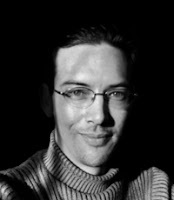 The author of Mr. Goop (Vivlia, 2010), a sci-fi children's novel, Ivor was nominated for the UMA Award (2009), and awarded The Golden Baobab Prize (2009). He is also the founder and managing editor of StoryTime, which has published a host of Nigerian authors, the blogger included. Ivor explains his "dilemma" further: "I’m hungry and thirsty, and absolutely none of the above is footing my survival bill. So what is hard for me as a writer? Simply finding the time to research and write, that’s it, that’s my biggest problem. Waiting for that special time when the world fades away and my characters and I can get down to having a blast, and seeing what new corners of my mind we can turn over rocks in and see what's there." Although well traveled and currently domiciled in Washington with her husband, Myne still visits Nigeria now and then. For me reading A Love Rekindled,her latest novel, reminded me of certain follies I was prey to during the roving undergrad years. She has more to say, however: “So the challenge for me as a writer using social networking is that of distraction, thereby reducing the amount of time I have to write. Personally, Facebook has proved the most addictive. I find that sometimes while updating my pages, I may stray into something else entirely and so on, thereby wasting precious amounts of time that could have been put to better use. There was a day I took a break from writing and as usual, the first point of call was Facebook. The site was down, and I kept refreshing it for almost five minutes before it dawned what I was doing. I laughed at myself, left a message on Twitter about my addiction and went to check some other things. I had to really think that day but it is what it is. At the end of the day, I have to find a way to balance the two by making sure that my internet use is mostly purposeful and in a way that is linked to my writing, and also set out a specific time for my writing itself without any distractions. Ahhh...I see that I have company, lol... Hi Ivor! Nice one, Uche, and thanks for sharing. I agree with boht of your guests, disturbance in whatever form is a problem. I sometimes think I should stop internet in my office, but then I start hyperventilating. Nice to read more about these two talented writers. Thanks Uche (lapidary, ha ha ha, ain't that the truth:), good to see I'm in good company Myne. I was looking a pics of famous writers and their isolated writing shacks the other day, something I aspire to have too one day (and of course it will have zero online capability). Beautiful contributions from both Ivor and Myne. They both spoke my mind. Time and space remains a big issue for me and I believe a lot of other writers (especially those with regular 9-5 jobs).